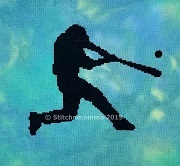 A simple stitch that would make a great gift for the baseball player or fanatic in your life. This design uses all full stitches. And nothing says your silhouette needs to be stitched in black. Be adventurous with your fabric and floss choices! Download Only: $7.00 You will download the pattern. Nothing will be mailed, so you pay no printing or shipping charges.